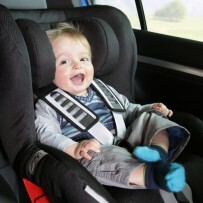 Home » Family safety » Avoid hot car deaths. Posted by Geraldine Hickey RN on July 17, 2018 in Family safety, Infant and child safety | Comments Off on Avoid hot car deaths. The greatest percentage of deaths from leaving a child in a hot car are unintentional. The parents are not “bad” parents. It is a result of forgetfulness in most cases. A parent just forgets about the child in the back of the car. Heat stroke is the second leading cause of non-traffic deaths among children. The inside of a car heats up quickly with 80% of the increase in temperature happening in the first 10 minutes. A childs’ thermoregulatory system is not the same as an adult. If a childs’ temperature rises to 107, their internal organs begin to shut down and this can lead to death. As a by-stander if you see a child alone in a car call 911 immediately.